As traders, we spend the majority of our time in front of computer screens. While this might not effect some traders, most of us feel the pain of needing to sit in front of our machines all day. 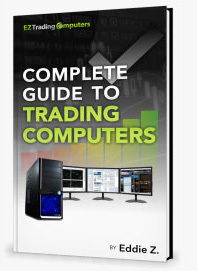 I used to walk away from my computer at the end of the trading day with a massive headache. I realized, during the market hours when I was concentrating on my trades, I was straining to see what was on my computer screen despite having a nice monitor setup. I made several changes like adjusting the height and distance of my monitors, taking short breaks throughout the day, and adjusting the font size of my computer. Right away I noticed a difference. These few adjustments really made an impact. If you’re like me, you might experience similar issues. The changes I made to my trading computer set up where quick and simple. It took me five minutes to make these changes. I was just ignoring the issue for too long and put off making the necessary changes. Adjusting the font size on your trading computer to make it more readable is a two minute change – maybe even less. In this video, I want to show you how you can increase the default font size on your computer so that it’s more readable. The first step is to go to your start menu. The next step is to click on control panel. After that, click on appearances and personalization. Next after clicking on appearances and personalization, click on font. From the left side of this window click change font size. Choose the font size that suits you best: small which is the default, medium as 125% zoomed, or large larger which is 150%. So, I could click 150% font size and click apply. Finally, Select Log off to finish applying the changes. Simply go to Control Panel. Then “change font size” from the left window, and go back to smaller. As before, you will need to log off of your computer profile in order to complete the adjustment. Once you log back on to your computer’s profile, you’ll see that the desktop icons, the fonts on the desktop icons, and all of the taskbar icons have changed. Everything has been increased quite a bit. Now, you can go to one of your active windows and you’ll see that everything is much larger. So, that is how you increase the font size.